Forty-eight workers who had escaped large underground coal-mine fires were interviewed using an open-ended protocol. 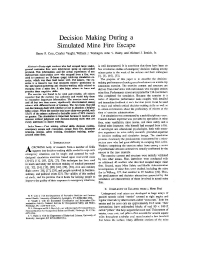 This information, and the actual experiences of one eight-person mine-section crew who escaped from a fire, were used to construct an 18-frame (page) table-top simulation exercise, which was then field tested with 134 miners. The exercise is a research tool that measures miners' proficiency in the information-gathering and decision-making skills related to escaping from a mine fire. It also helps miners to learn and practice these cognitive skills. The exercise was found to be valid and reliable. All miners reported that the exercise was authentic and would help them to remember important information. The exercise total score, and all but two item scores, significantly discriminated among miners with different levels of training. The two items that did not discriminate dealt with whether or not to abandon a helpless fellow miner. When the exercise total score data were pooled, only 13.6% of the miners achieved a desirable score of 90% mastery or greater. The simulation is important because it teaches and assesses critical judgment and decision-making skills that are rarely addressed in miner training.